ADP Group’s ground survey team from Wotton under Edge have recently been seen carrying out a ground survey on the long unoccupied Cheapside Wharf site at Wallbridge. What some towpath users took to be pile driving equipment was, in fact, a drilling rig. Tristan Rendell led ADP’s survey team. Tristan and his colleagues dropped in to the Cotswold Canals Trust Visitor Centre at Wallbridge Lock to explain that, in fact, building work had not yet commenced. 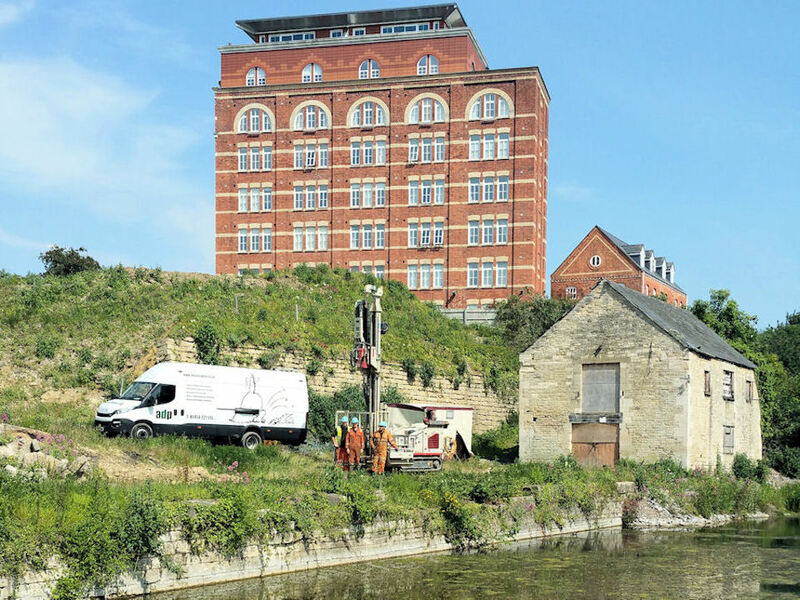 He explained that his company had been engaged by Cheltenham based property developers Newland Homes to obtain strata samples from a depth of 10 metres beneath what was once Stroud's coal wharf. The work included fitting 50mm pvc wells that will be monitiored to gauge water retained. Chris Parker of Newland Homes supplied the image below to demontrate that his company is engaged in some positive steps toward realising an exciting and sustainable transformation of Cheapside Wharf. Chris explains, "After a complex and exhaustive process lasting two years, we are at last able to confirm that contracts have been exchanged to buy the long term vacant Cheapside site, subject to gaining planning consent. "Some further site investigations are currently taking place. Previously the site had been granted planning permission for 103 dwellings and a range of other uses." The Newlands scheme is now for thirty seven units. Newlands reported that feedback from an exhibition of proposals displayed at the Canal Trust Visitor Centre from October to December 2014 had been very helpful. The project will include the renovation of the derelict Grade II listed Wallbridge Warehouse to provide some work or display space. A small retail unit within the canal frontage apartment block is also planned. Chris Parker sums up… “The consultations have resulted in improved pedestrian access through the site towards the town centre. Canal-side access and central space in front of the warehouse is also provided. "The Cheapside frontage has been redesigned following public comments that suggested a preference for more traditional elements, whilst retaining a contemporary design to the development as a whole. “Finally we have introduced extensive renewable energy in the form of solar panels, as well as generous balconies for householders to enjoy the southerly canal-side aspect. The canal-side relationship is crucial to this site. Despite the major development costs we have set aside a substantial financial contribution towards canal bank works. "Such contributions will repair the broken canal wall and renovate the derelict listed warehouse. A purpose designed pontoon will also be constructed to provide visitor mooring points and direct access for canal boat users onto the canal edge along the site frontage.